Virtual right-turn lanes permit right turns only when a transit vehicle is not present. When a transit vehicle approaches, right turns are prohibited. Transit signals are triggered to allow transit vehicles to pass through the intersection. Streets with moderate transit service frequency, often with streetcar operating in a mixed-travel or shared turn lane. At intersections where right-turning vehicles are subject to delays while yielding to pedestrians and bicyclists. Prohibiting turns when transit is present may be beneficial with or without a dedicated transit lane, especially for streetcars. Transit priority is provided, with minimal impact on general network connectivity. Drivers planning to turn right may change lanes and wait in the second lane until right turns are permitted, increasing motor vehicle delay. Traffic signals must be transit responsive, using an AVL system, an operator control, or an advance loop detector. The right-turn prohibition is communicated to drivers with a NO RIGHT TURN blank-out sign (MUTCD R3-1 or 1a) potentially accompanied by an LRV symbol blank-out sign. Signage must communicate to vehicles that they are prohibited from entering the transit lane while the transit vehicle is present. A dedicated transit lane should be prominently marked and may be colored red on approach to the intersection before dropping into a shared right-turn/transit lane. 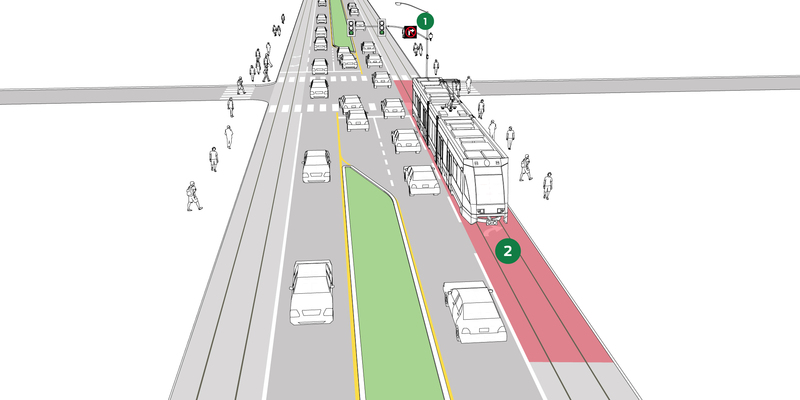 Dedicated lanes increase the transit vehicle’s ability to reach the signal unimpeded. A right-turn arrow may be used when transit vehicles are not present.